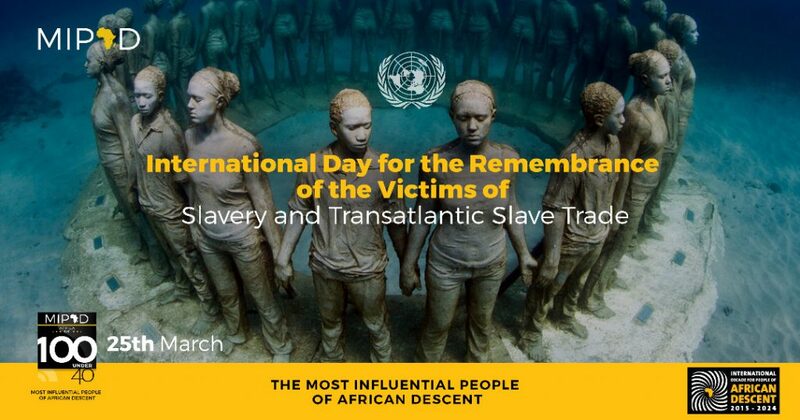 Every year on 25 March, the International Day of Remembrance of the Victims of Slavery and the Transatlantic Slave Trade offers the opportunity to honour and remember those who suffered and died at the hands of the brutal slavery system. The International Day also aims to raise awareness about the dangers of racism and prejudice today. In order to more permanently honour the victims, a memorial has been erected at United Nations Headquarters in New York. The unveiling took place on 25 March 2015. The winning design for the memorial, The Ark of Return by Rodney Leon, an American architect of Haitian descent, was selected through an international competition and announced in September 2013. This year 2019 theme is “Remember Slavery: The Power of the Arts for Justice” Since the time of the Transatlantic Slave Trade, the arts have been used to confront slavery, empower enslaved communities and honour those who made freedom possible. They have also been vital tools in commemorating past struggles, highlighting ongoing injustices and celebrating the achievements of people of African descent. The 2019 theme, therefore, draws attention to the many examples of artistic expression – including memorials, music, dance and architecture – that have helped us to remember the history and consequences of the Transatlantic Slave Trade. You, MIPADians the 1% inspiring the 99% to embrace EXCELLENCE. Thank you for all that you do. Join us as we celebrate two years of GRACE.